After MASCOT had separated from its mothercraft, Hayabusa2's ONC (Optical Navigation Camera) recording system, with its three cameras, began following MASCOT’s descent to the asteroid Ryugu from a height of 51 metres. The image section is oriented to the north, and the area shown is located at approximately 300 degrees east and 30 degrees south. Hayabusa2’s shadow can be seen on the lower right. At the time of the separation, it was about noon on Ryugu and the Sun was behind Hayabusa2 – the shadow is about six by 4.5 metres. The points indicate the times at which Hayabusa2 acquired images of MASCOT. The times are in UTC (Coordinated Universal Time, CEST minus two hours), the first image was acquired at 01:59 and 40 seconds UTC (03:59:40 CEST). 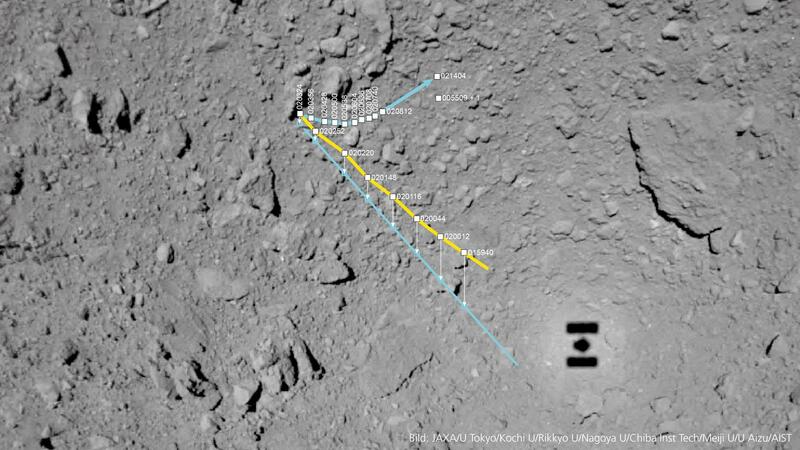 The yellow line indicates the locations at which MASCOT was still descending towards Ryugu and where it could be identified in the ONC photos. The blue line below the yellow line is the projection of these positions onto the asteroid surface – so this shows MASCOT's flight route was rather straight, and the lander touched down on a large edgy block at around 02:23 and 24 seconds UTC. From there, the asteroid lander hopped along the curved horizontal line towards the east-northeast and was then repeatedly imaged by the ONC. At around 02:14 and 04 minutes UTC MASCOT came to rest at its first location on the asteroid. Meanwhile, Hayabusa2 ascended to a higher observation position over Ryugu, making it more difficult to identify MASCOT in the images due to the lower image resolution. On the second asteroid day, MASCOT's mobility mechanism was activated. Another image will show the lander on 4 October at 00:55 and nine seconds UTC. Credit: JAXA/U Tokyo/Kochi U/Rikkyo U/Nagoya U/ Chiba Inst Tech/Meiji U/U Aizu/AIST. 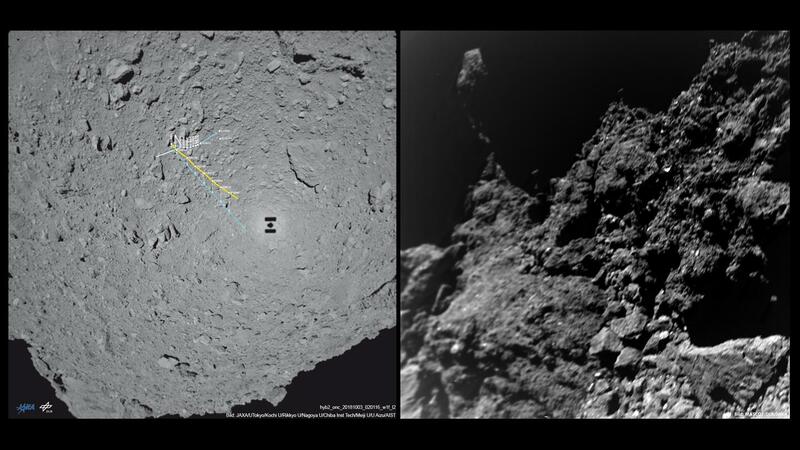 The image on the right shows the first image acquired by the DLR-developed MASCAM camera system during Hayabusa2's descent, shortly after separation from the landing module at a height of 51 metres with a viewing direction towards the south pole. The area captured by MASCAM is marked as an open triangle in the overview image on the left, which was taken with the wide-angle camera of the ONC (Optical Navigation Camera) system of the Hayabusa2 spacecraft. Particularly striking is a huge block near the South Pole, which stands out clearly above the horizon line and which the scientists named 'South Polar Rock'. It may be several dozen, and even up to 100 metres tall. Credit: JAXA/U Tokyo/Kochi U/Rikkyo U/Nagoya U/ Chiba Inst Tech/Meiji U/U Aizu/AIST (links); MASCOT/DLR/JAXA (rechts). The second image of the DLR-developed MASCAM camera is directed obliquely downward on the asteroid Ryugu and covers areas east of the descent route. The area covered by MASCAM is marked as an open trapezoid in the overview image of the wide-angle camera of the ONC (Optical Navigation Camera) system of Hayabusa2. Compared with the first image, it is clear that MASCOT moved turbulently towards Ryugu, as expected, thus performing turns and rollovers. Both images show a huge boulder, which occupies the eastern (right) edge of the image in the MASCAM image and is several tens of metres in length. 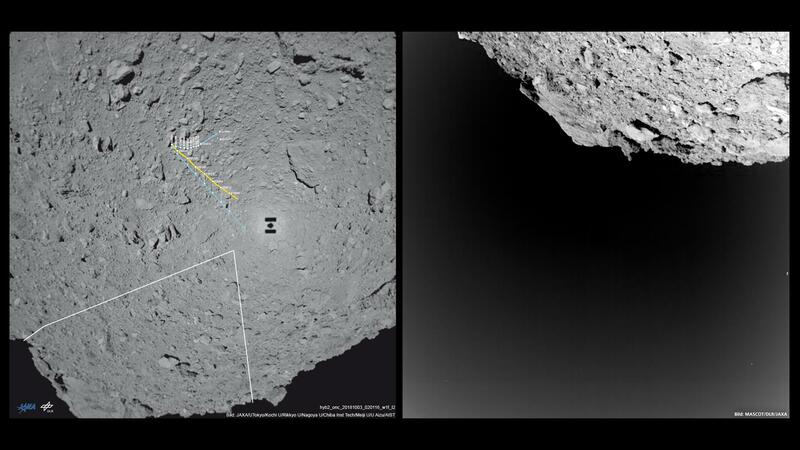 On the bottom left is MASCOT's shadow, which the Sun behind the landing probe is projecting onto the asteroid surface: MASCOT is 30 centimetres long. Ryugu is a body with no atmosphere, so the outlines of MASCOT (right) and Hayabusa2 (left) are sharp in the shadows projected onto the asteroid surface. Before the first contact with a large rock on Ryugu, DLR's MASCAM camera photographed the area of the descent route with a backward-looking view. The area covered by MASCAM is marked as an open trapezoid in the overview image of the wide-angle camera of Hayabusa2's ONC (Optical Navigation Camera) system. 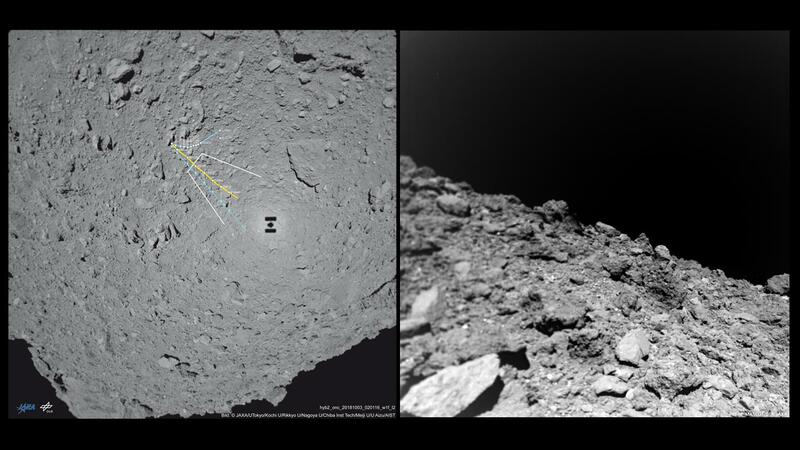 The fifth image acquired by the DLR-developed MASCAM camera system (right) was taken shortly after the first contact with the ground, just a few metres above the surface of Ryugu. The line of sight is directed to the northwest and is located between the two white boundary lines in the overview image (left) acquired by the wide-angle camera of the ONC (Optical Navigation Camera) system on board Hayabusa2. Just as in the images from higher altitudes, no fine material, known as regolith, can be seen, even in the immediate vicinity of the surface. Regolith is formed on atmosphere-less bodies due to their permanent exposure to high-energy particles from space or micrometeorites due to the weathering of coarser material into dust. Instead, the area is extremely rugged and full of sharp blocks. The landing site environment is reminiscent of the Abydos landing site of the Philae lander, which was released on Comet 67P / Churyumov-Gerasimenko by the Rosetta spacecraft on 12 November 2014. 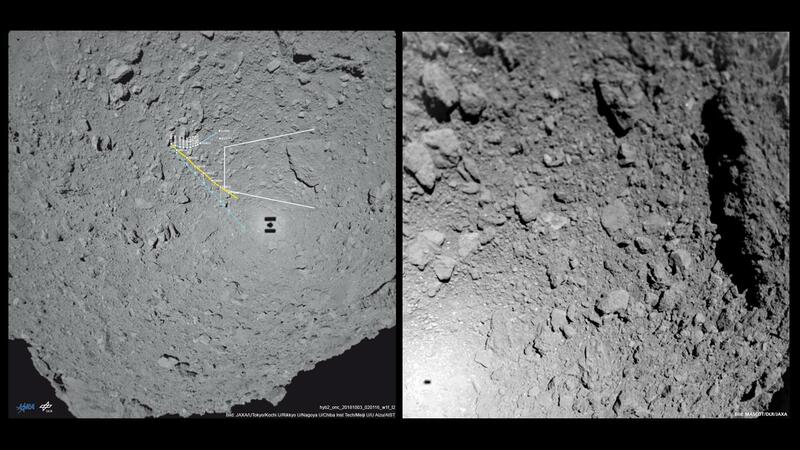 The scientists were able to follow the path that MASCOT travelled on the surface of Ryugu on the basis of images and data from the mother probe Hayabusa2 and the lander. Six minutes of free fall, a gentle impact on the asteroid and then 11 minutes of rebounding until coming to rest. That is how, in the early hours of 3 October 2018, the journey of the MASCOT asteroid lander began on Asteroid Ryugu – a land full of wonder, mystery and challenges. Some 17 hours of scientific exploration followed this first 'stroll' on the almost 900-metre diameter asteroid. The lander was commanded and controlled from the MASCOT Control Centre at the German Aerospace Center (Deutsches Zentrum für Luft- und Raumfahrt; DLR) site in Cologne in the presence of scientific teams from Germany, France and Japan. MASCOT surpassed all expectations and performed its four experiments at several locations on the asteroid. Never before in the history of spaceflight has a Solar System body been explored in this way. It has now been possible to precisely trace MASCOT’s path on Ryugu’s surface on the basis of image data from the Japanese Hayabusa2 space probe and the lander’s images and data. Around 20:04 Fourth location The last jump is commanded to MASCOT and the lander goes into the End of Life phase. Further scientific investigations are carried out.